Transistor is the first game I've ever played where I wanted to ascribe the word "impressionist" to its charms. And I don't mean because of its graphics—despite the hand-painted look of Transistor's world, you'd be hard-pressed to compare it to Monet or Degas and see much similarity. Transistor's vaguely tech-inspired environs and characters live exclusively in crisp lines and flat palettes. But Transistor is an experience conveyed in broad swathes of music, of voice acting, of art direction, of lore. That's not to say there's no detail to be found. On the contrary—every aspect of Transistor is painstakingly crafted. Yet come the end of the game you won't be thinking of any of that. You won't be mulling on the game's excellent combat or its phenomenal soundtrack or its lush art, because it all combines together into one overwhelming experience. The pieces are so intricately tied together it's impossible to divorce one, focus on it, and say "This is what makes Transistor work." At the end of it all, you'll be thinking about a sword, a disembodied voice, and a woman named Red. If you're like me, you'll even be emotional. Transistor is not Bastion. Seriously, it's not. Supergiant's sophomore effort shows a studio with a strong style, though. Transistor plays wildly different from Bastion—in some ways better, other ways worse—but there's no denying they share DNA. Like Bastion, Transistor is a third-person, isometric action game that heavily features voiceover narration and a unique arsenal of weaponry. Oh, and Darren Korb's haunting soundtrack, which ties the whole experience together. Korb plays even more heavily into Transistor than he did in Bastion, considering you play as Red—once a renowned musician, now mysteriously gone mute. The control scheme even has a button to make Red hum, at which point she'll seamlessly add her voice to whatever background music is playing. It's an aesthetic effect—there's no gameplay reason for Red to hum, and outside of a few environmental effects nothing happens. But I'll be damned if it isn't beautiful. 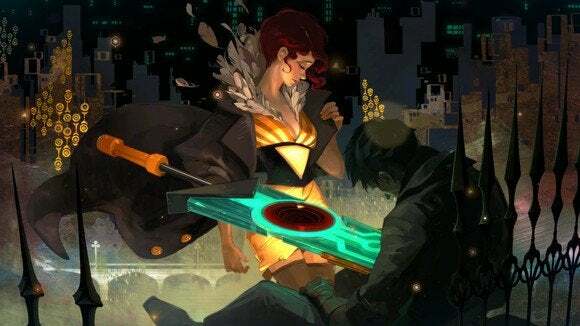 You take control of Red standing in the street, crouched over a dead man with a sword-like weapon—the titular "transistor"—emerging from his chest. The sword glows in time with a man's voice. "Hey Red...we're not going to get away with this, are we?" Cue twangy guitars. It's altogether mysterious, but there's not much time to think. You have to hurry—to try and save the city, and maybe regain your voice in the process. A mysterious, creeping epidemic known only as "The Process" has begun wiping out entire city blocks. And I don't mean simply "killing whoever is there." I mean erasing those blocks from existence, replacing the bright and vivid world of Cloudbank with white nothingness. It's all the fault of a shadowy group known as the Camarata—also the people responsible for your lost voice, and for the dead man at the beginning. Hunt down the Camarata. Stop "The Process." Save the world. All in a day's work for Cloudbank's favorite singer. Helping Red on her quest are a wide array of functions, which are actually dead people who've been absorbed into the transistor. Or dead programs, maybe. There's more than a subtle hint of Tron in Transistor, and every attack you execute is styled after simple tech jargon. The basic attack, for instance, is known as "Crash()" and stuns target enemies for a few seconds. You unlock the first few functions by exploring the world, and the rest by leveling. And, like Bastion, there's an overwhelming amount of choice in your weaponry. Each function has three tiers: Active, Upgrade, and Passive. Active functions are your four main attacks. For instance, you might have Crash (a basic melee attack), Ping (a fast ranged attack), Void (an area-of-effect debuff), and Jaunt (used to teleport). These moves can be used by hitting the four face buttons on the controller (recommended) or the numbers 1-4 on a keyboard. Then you can upgrade your Active moves with up to two other functions, transforming it. When you use Bounce() in an Active slot it generates a ray that hits multiple enemies. Use it to upgrade Crash(), however, and now that attack will hit multiple enemies. Or you can stick any function into a Passive slot. These effects range from generating a shield to recovering health during combat. Each of these moves takes up a certain amount of Red's memory banks, so you'll have to make some hard choices. Do you run with a large number of weaker attacks or focus on one or two powerful moves with a lot of passive slots filled? There's not really a "right" method, encouraging you to tinker until your find "the perfect way to play." Combat is active-pause. You can run around in real-time and attack enemies, same as Bastion. You can also pause the game at any time to queue up attacks and movements, however. Unpause and Red will unleash her queued instructions, but you'll then be vulnerable for a few seconds as she recharges. Pausing is handy for precision and for particularly tough enemies, but I found myself using it less as the game went on—primarily because of the recharge period. If you're brought down to zero health, you don't actually die. If your pause mode (called Turn) is fully charged, you'll automatically enter that state and earn a chance to escape. If your Turn isn't recharged, though, you'll Overload and lose access to one of your four Active attacks. You have to Overload four times to actually "lose," but it can be a huge pain if you're forced to finish out a fight with only your weakest attack. My biggest gripe with the combat is it actually peaks about two-thirds of the way through the game. That's the point where it hits maximum complexity, with large numbers of fully-upgraded enemies for you to puzzle through. Then, inexplicably, all the enemy variety disappears and you face fairly rote and uninspired enemies for the last 20% of the game, culminating in a boss battle that's a bit easy and anticlimactic. The game does feature a New Game Plus mode, though, where you keep all your levels and abilities at the expense of stronger enemies from the beginning, and that mode looks like it will bring a ton more depth and challenge to Transistor. I'm looking forward to running the game again. But as I said, Transistor is pure impressionism. The combat, the voice over narration (at once both similar and entirely different from Bastion), the music, the art, the way Red drags her sword while running, the creeping white horror of The Process—this is a game that elicits emotion with the smallest of guitar twangs, or the sparsest of dialogue exchanges. Transistor is only five or six hours long, and that leaves me sad. Not because the game feels incomplete (although it does wrap up a bit too quick), but because I wish there were more of it. After waiting for Supergiant's sophomore effort this long, I wanted to exist in Transistor's world just a little while longer. I wanted another line, another environment to hurriedly scramble across, another song with which I could hum along. I do want to add that the game was more than a bit unstable during review. I never lost progress, thanks to abundant checkpoints, but I did have the game crash to desktop five or six times. Hopefully these issues get ironed out in an early patch, but if you're an early adopter be aware there are some problems. Every aspect of Transistor is painstakingly crafted, from its compelling combat to its sharp graphics to Darren Korb's haunting soundtrack. This is a game to get.